Context: The study of photon interactions with biological materials is essential in radiation medicine and biology, nuclear technology and space research, since radioactive sources are used. Aims: A study of mass attenuation coefficient, effective atomic numbers (Zeff) and electron density of some commonly used skeletal muscle relaxants. Materials and Methods: We have measured the mass attenuation some commonly used skeletal muscle relaxants such as tubocurarine chloride, gallamine triethiodide, pancuronium bromide, suxamethonium bromide and mephenesin for various gamma sources of energy ranging from 84keV to 1330 keV (170Tm, 57Co, 141Ce, 203Hg, 51Cr, 113Sn, 22Na, 137Cs, 60Co, 22Na and 60Co). The measured values agree with the theoretical values. 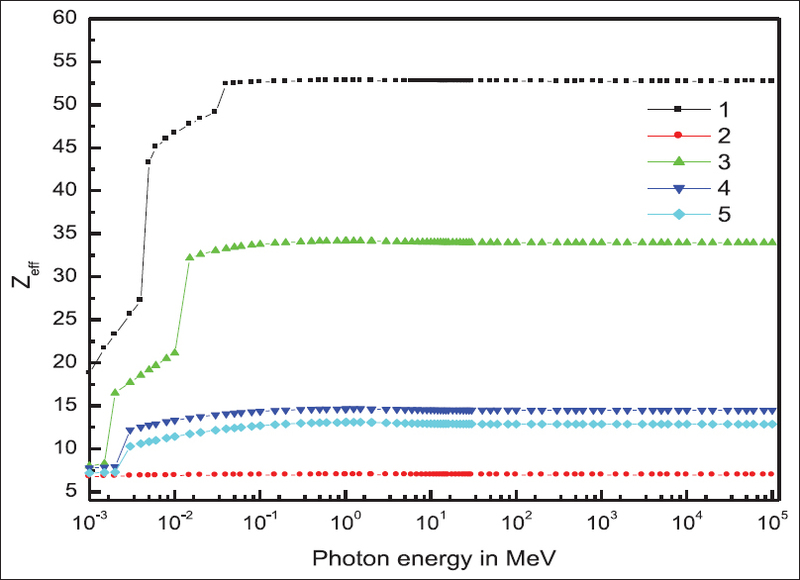 The effective atomic numbers (Zeff) and electron density (Ne) of commonly used skeletal muscle relaxants for total and coherent, incoherent, photoelectric absorption, pair production in atomic and nuclear field photon interaction have been computed in the wide region 1keV to 100GeV using an accurate database of photon-interaction cross sections and the WinXCom program. Results: The significant variation of Zeff and Nel is due to the variations in the dominance of different interaction process in different energy regions. A comparison is also made with the single values of the Zeff and Nel provided by the program XMuDat. We have also calculated CT numbers, kerma values relative to air and dose rate for relaxants which are also not remaining constant with energy. Conclusions: The computed data of mass attenuation coefficient, effective atomic numbers (Zeff) and electron density and CT numbers in the low energy region helps in visualizing the image of the biological samples and precise accuracy in treating the inhomogenity of them in medical radiology. The calculated kerma values relative to air and dose rate for relaxants are useful in radiation medicine. The study of photon interactions with biological materials is essential in radiation medicine and biology, nuclear technology, and space research since radioactive sources are used. 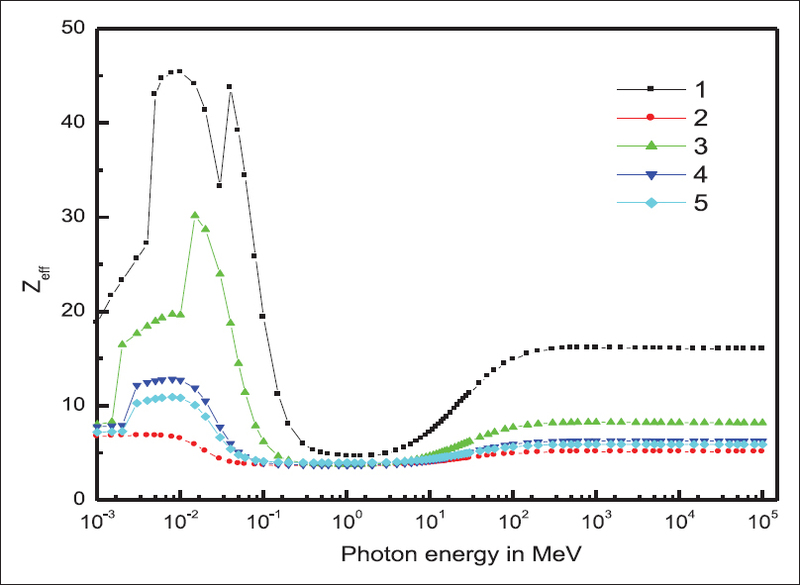 Photons in the keV range are important in radiation biology as well as in medical diagnostics and therapy Hubbell. 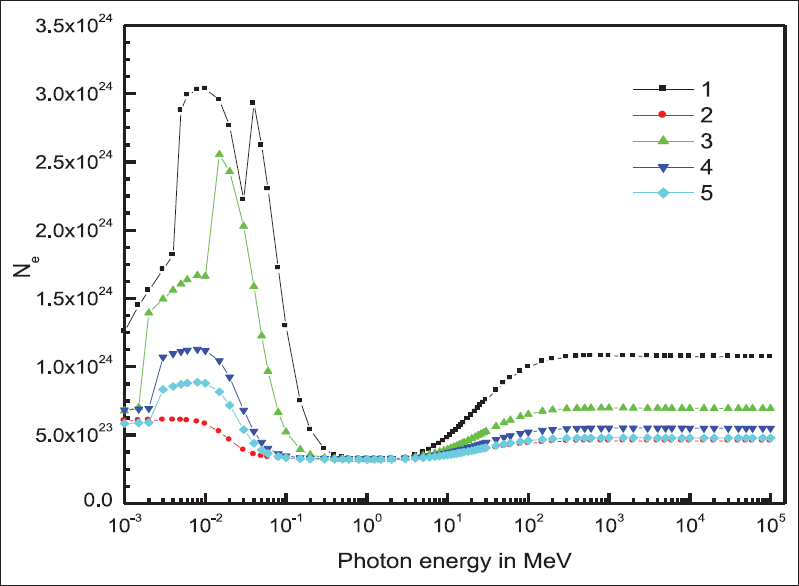 Photons in the MeV range finds importance in the field of radiography and medical imaging, and photons in the GeV range are of interest in astrophysics and cosmology. Hine  stated that a single number cannot represent the Zeff of a complex material. The parameter Zeff is very useful in choosing a substitute composite material in place of an element for that energy depending on the requirement. The energy absorption in the given medium can be calculated by means of well-established formulae if certain constants such as Zeff and Nel of the medium are known. Among the various parameters determining the constitutive structure of an unknown object or material, one should especially note the effective atomic number. In fact, this value can provide an initial estimation of the chemical composition of the material. A large Zeff generally corresponds to inorganic compounds and metals, whereas a small Zeff(≤10) is an indicator of organic substances. Several investigators have measured or calculated Zeff for human tissue and other biological materials (Yang et al. 1 (1987), Rao et al. 1985).,, So far, to our knowledge, no study has been done for skeletal muscle relaxants (Biomedical compounds). 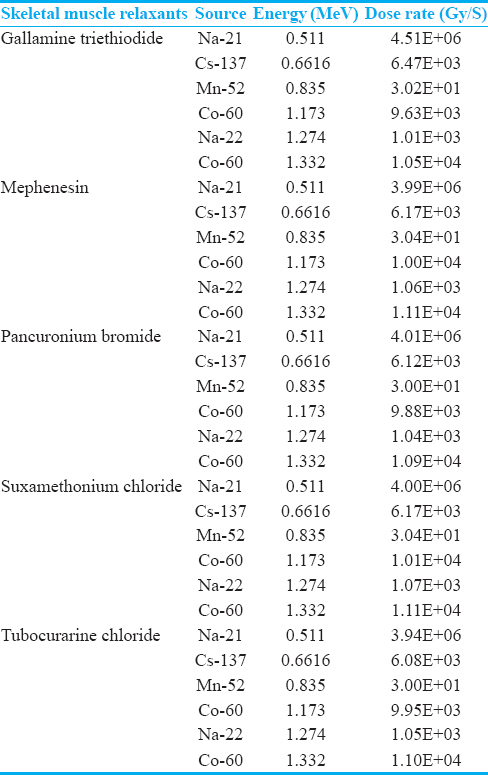 In this study, skeletal muscle relaxants such as tubocurarine chloride, gallamine triethiodide, pancuronium bromide, suxamethonium bromide, and mephenesin have chosen, and its composition is given in [Table 1]. These agents are used as adjuvant to anesthesia to get the relaxation of skeletal muscle during the corrections of dislocations, surgery, radiotherapy, etc., and used as relieving painful muscle spasms because of various musculoskeletal and neuromuscular disorders. Hence, accurate calculation of photon mass attenuation coefficient, effective atomic number Zeff, electron density Ne, and computed tomography (CT) numbers of above relaxants are important in medical diagnostics. The calculation of CT numbers of relaxants is important which gives the necessary information about relative electron density. Hence, the above parameters become a vital, interesting, and exciting field of research for characterization and visualization of matter (biological samples) in the medical field. The CT number outlines the inhomogeneities and also gives the direct information of the electron density from which accurate corrections can be made by suitable treatments. Even dose calculations are made based on the patient-specific information obtained from X-ray CT. When a beam of photons passes through an absorber, the photons interact with the atoms and are either absorbed (photoelectric effect, pair and triplet production, and photonuclear) or scattered away from the beam (coherent and incoherent scattering). The intensity of the transmitted beam of photons is the sum of the cross-sections, per atom for all the above processes. Hence, the total molecular cross section σmol is determined from the following equation using the values of the mass attenuation coefficient of relaxants using (µ/ρ)bio obtained by running WinXCOM program (2004). Where fi is the fractional abundance (µ/ρ)i is mass attenuation coefficient of ith element. Where, and Zi is the atomic number of ith element in a molecule, respectively. 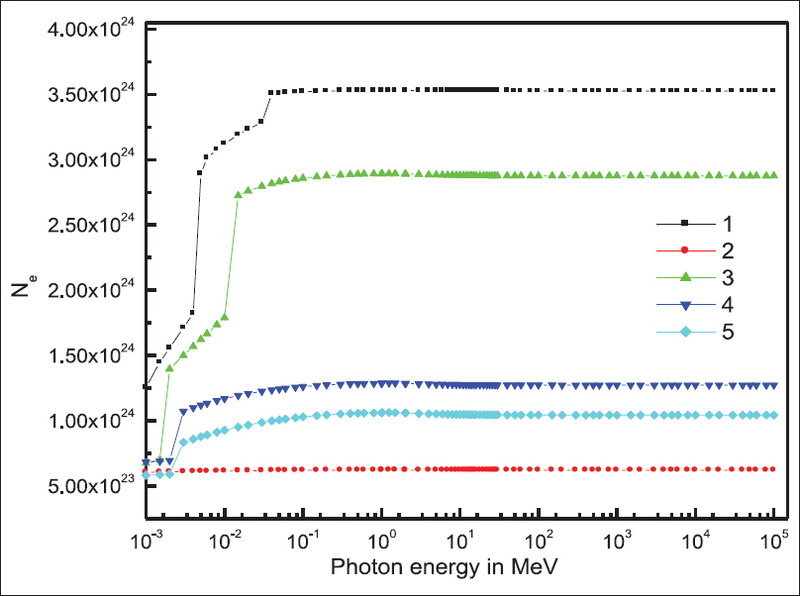 In the present work, we have generated mass attenuation coefficients and photon interaction cross sections in the energy range from 1 keV to 100 GeV using WinXCom. This program uses the same underlying cross-sectional database as the well-known tabulation of Hubbell and Seltzer. WinXCom makes it possible to export the cross-sectional data to a predefined MS Excel template, a feature that greatly facilitates the subsequent graphical and numerical data analysis. 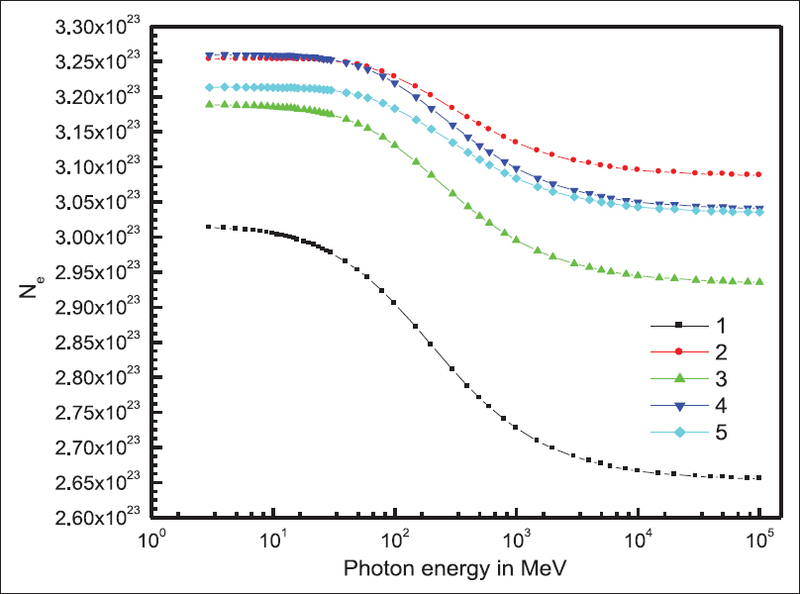 XMuDat  is an alternative program for calculating photon interaction cross sections and absorption coefficients of elements, compounds, and mixtures in the energy range from 1 keV to 50 MeV. For a given compound, XMuDat also provides two single values for the effective atomic number and the electron density, respectively. In the present work, we have calculated Nel using equation (7). CT number is a normalized value of the calculated X-ray absorption coefficient of a pixel (picture element) in a computed tomogram, expressed in Hounsfield units. We have also calculated CT number using following equation given by Thomas et al. μm and μw are energy attenuation coefficient of given material and water, respectively. The values of (μen/ρ)i have been taken from the compilation of Hubbell and Seltzer. We have estimated photon absorbed dose rate of some commonly used gamma sources (Na-21, Cs-137, Mn-52, Co-60, and Na-22) in skeletal muscle relaxants. The narrow geometry experimental setup is as shown in [Figure 1]. We have used a NaI(Tl) crystal detector (5.8 cm 2× 5.8 cm 2) mounted on a photomultiplier tube housed in a lead chamber and a sophisticated PC-based MCA for a detection purpose, gamma sources such as 170 Tm (84 keV),57 Co (122 keV),141 Ce (145 keV),203 Hg (279 keV),51 Cr (320 keV)113 Sn (392 keV,22 Na (511 keV),137 Cs (662 keV),60 Co (1170 keV),22 Na (1274 keV), and 60 Co (1330 keV). The sample was directly attached to the opening of the lead shield where source is placed. The integral intensities, I0 and I of the beam before and after passing through the sample are measured for sufficient time (μ/ρ) is then estimated using the relation. Where, t and ρ are the thickness and density of the sample, respectively. The measured (μ/ρ) is compared with theoretical values, and it is given in [Table 2] and [Table 3]. The measured values agree with the theoretical values. The values of these parameters have been found to change with energy and interaction of gamma with the medium. The Zeff and Ne and CT numbers of skeletal muscle relaxants tubocurarine chloride, gallamine triethiodide, pancuronium bromide, suxamethonium bromide, and mephenesin are computed in the energy region 1 keV–100 GeV. It is found that Zeff and Ne of relaxants vary with energy and composition of them. This variation is shown in the [Figure 2],[Figure 3],[Figure 4],[Figure 5],[Figure 6],[Figure 7],[Figure 8],[Figure 9],[Figure 10],[Figure 11],[Figure 12],[Figure 13] for total and all partial photon interaction (coherent, incoherent, photoelectric absorption, and pair production in atomic and nuclear field). 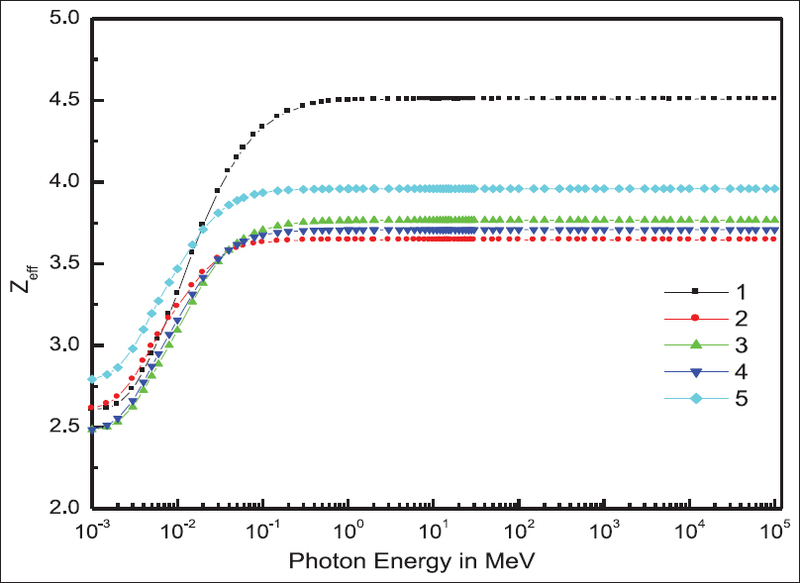 The variation of Zeff with photon energy for total photon interactions is as shown in [Figure 1] and this variation is because of dominance of different photon interactions with skeletal muscle relaxants. 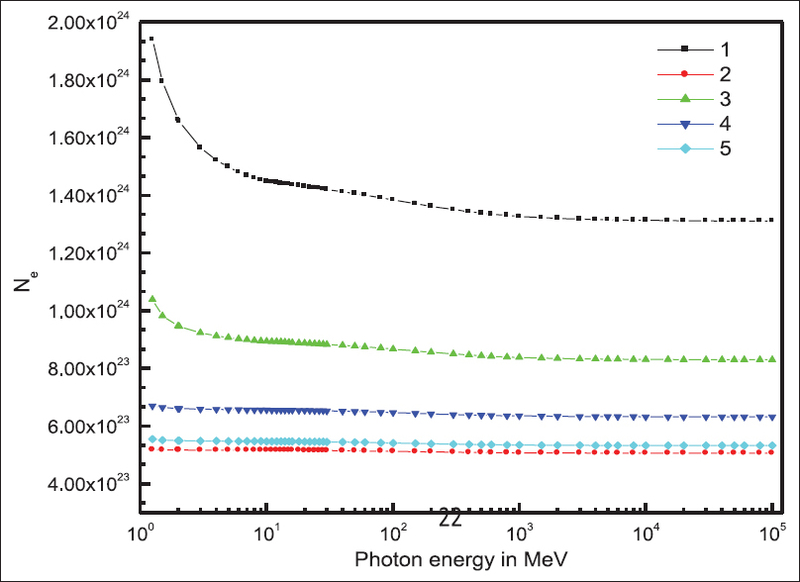 In lower energy region, photoelectric interaction dominates, hence Zeff varies similar to photon interaction. Except mephenesin, all other relaxants Zeff increases and becomes maximum and decreases sharply in the energy region 0.002–025 MeV. These variations are due to the presence of halogens (Cl, Br and I) in their composition and these elemental cross sections vary larger in the energy region 0.002–025 MeV. The Zeff and found to remain constant up to 10 MeV, which shows that scattering (coherent and incoherent) processes increases. 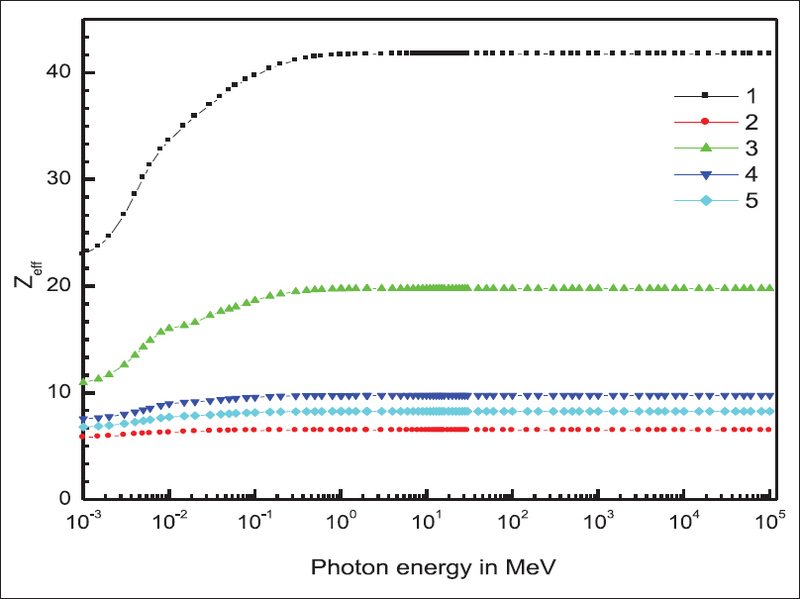 From 10 MeV to 100 MeV, there is a regular increase in the Zeff with photon energy. This is due to the increase in incoherent and pair production processes. From 100 MeV onward Zeff remains constant which is due to dominance in pair production processes. The Zeff values of relaxants vary from the element with lowest Z to the highest Z present in their composition. Usually, above relaxants may be administered to the patient before treatment. Hence, while treating tissue inhomogeneity of the patient, the contribution of CT numbers of relaxants has to be considered though the values are very small. 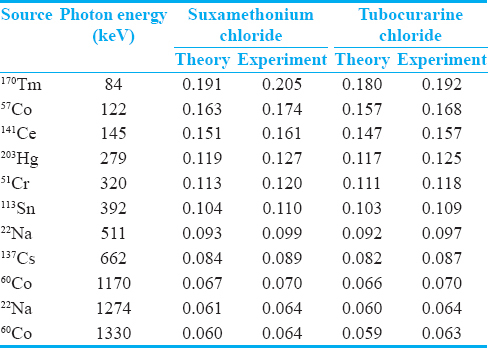 The CT numbers for total photon interaction is given in [Table 4]. The CT numbers for coherent, incoherent, and photoelectric absorption region and total photon interaction helps in visualizing the image of the biological samples and precise accuracy in treating the inhomogeneity of them in medical radiology. For a given compound, the XMuDat program provides two single values, (Zeff)XMuDat program, and (Nel)XMuDat for the effective atomic number and the electron density, respectively. The comparison of computed max (Zeff)win, min (Zeff)win, max (Nel)win, and min (Nel)win with XMuDat program is given in [Table 5] and [Table 6]. Where, max (Zeff)win, min (Zeff)win, max (Nel)win, and min (Nel)win, are the maximum and minimum values of the atomic number and the electron density obtained in our calculations using WinXCom in the energy range from 1 keV to 100 GeV. It is not clear from the documentation of the software how XMuDat actually calculates the effective atomic number and the electron density. However, it is obvious from the data that in [Table 5] and [Table 6], (Zeff)XMuDat and (Nel)XMuDat are not related by equation (7), since for each compound (Zeff)XMuDat is close to max (Zeff)win, whereas 0 (Nel)XMuDat is in perfect agreement with min (Nel)win., As discussed above, max (Zeff)win occurs in the low-energy region, where photoelectric absorption is the main interaction process, and min (Nel)win occurs at intermediate energies, where Compton scattering is dominant. It follows that XMuDat calculates (Zeff)XMuDat by assuming photoelectric absorption is the main interaction process. In contrast, (Nel)XMuDat has been calculated assuming that Compton scattering is dominating. Thus, users of XMuDat should be aware that the calculations of the two single values, (Zeff)XMuDat and (Nel)XMuDat are based on two different assumptions. 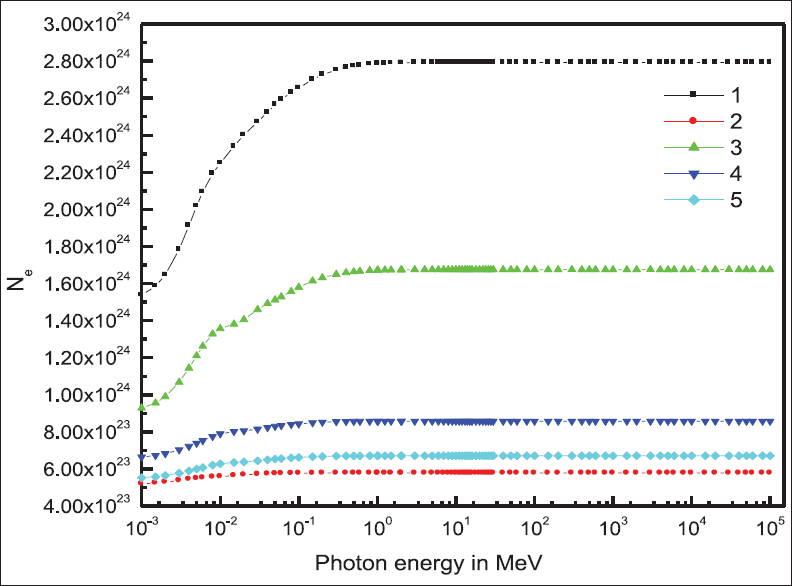 The energy dependence of kerma relative to air is tabulated in [Table 7]. For Gallamine triethiodide kerma values relative to air increases up to 0.05 MeV; thereafter, it keeps on decreases and becomes minimum at 1.5 MeV. At higher energies, these values increase. For Mephenesin kerma values relative to air increases with increase in energy and becomes maximum at 0.3 MeV. It shows slight increasing trend at higher energies. For pancuronium bromide, kerma values decreases with energy from 0.1 MeV to 0.4 MeV. After this energy, kerma values remain almost constant. For Suxamethonium chloride and Tubocurarine chloride kerma values decreases with energy, thereafter it becomes constant. 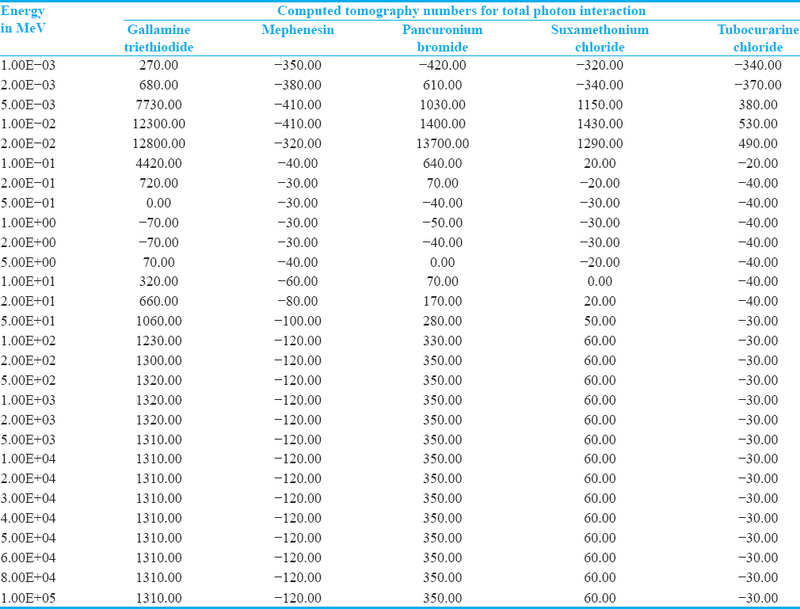 The evaluated absorbed dose rate at a distance 1 m from a point gamma sources such as Na-21, Cs-137, Mn-52, Co-60, and Na-22 in skeletal muscle relaxants are as shown in [Table 8]. Absorbed dose rate at of relaxants is maximum for Na-21 and minimum for Mn-52. We have measured the mass attenuation coefficients of some commonly used skeletal muscle relaxants such as tubocurarine chloride, gallamine triethiodide, pancuronium bromide, suxamethonium bromide, and mephenesin for various gamma energies (84 keV to 1330 keV). The measured values agree with the theoretical values. The measured effective atomic numbers (Zeff) and electron density (Ne) are compared with theoretical values. We have also calculated CT numbers, kerma values relative to air, and dose rate for relaxants. These parameters are useful in the radiation medicine. Hubbell JH. Review of photon interaction cross section data in the medical and biological context. Phys Med Biol 1999;44:R1-22. Hine GJ. The effective atomic number of material for various γ interaction. Phys Rev 1985;85:725-30. Yang NC, Leichner PK, Hawkins WG. 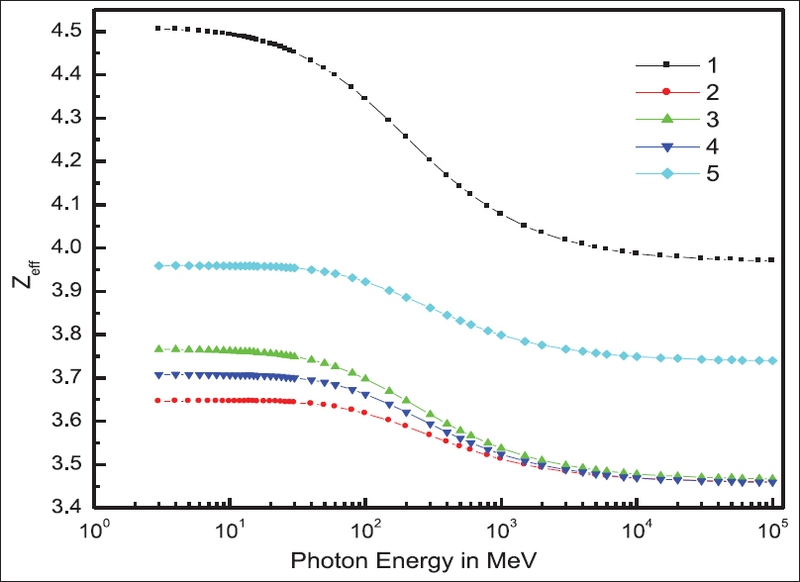 Effective atomic numbers for low-energy total photon interactions in human tissues. Med Phys 1987;14:759-66. 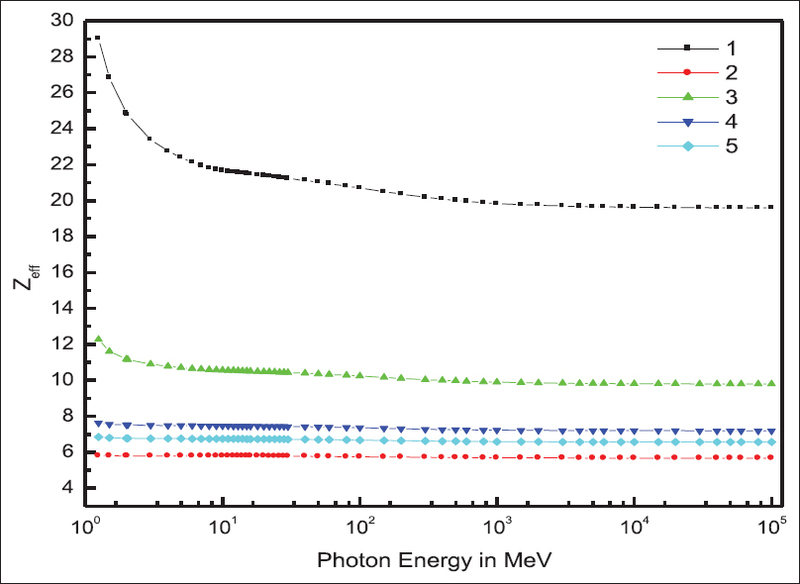 Rao BV, Raju ML, Rao BM, Narasimham KL, Parthasaradhi K. Interaction of low energy photons with biological samples and effective atomic number. Med Phys 1985;12:745-8. Manjunathaguru V, Umesh TK. Effective atomic numbers and electron densities of some biologically important compounds containing H, C, N and O in the energy range 145-1330 keV. J Phys B At Mol Opt Phys 2006;39:3969-81. Gerward L, Guilbert N, Jensen KB, Levring H. WinXCom – A program for calculating x-ray attenuation coefficients. Radiat Phys Chem2004;71:653-4. Hubbell JH, Seltzer SM. 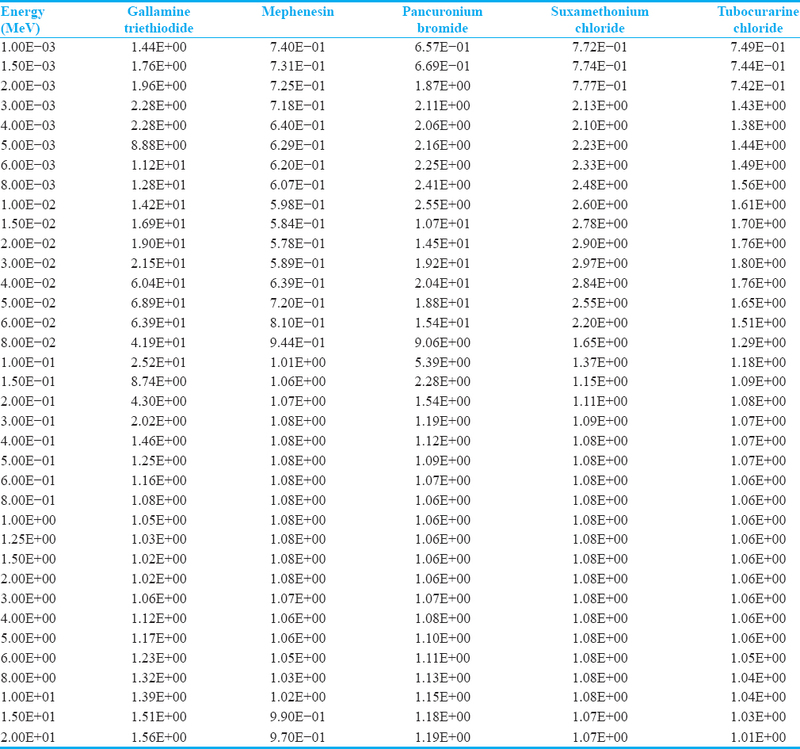 Tables of x-ray mass attenuation coefficients and mass energy absorption coefficients from 1 keV to 20 MeV for elements Z = 1 to 92 and 48 additional substances of dosimetric interest NISTIR-5632. Gaithersburg, MD: National Institute of Standards and Technology; 1995. Nowotny R. XMuDat: Photon attenuation data on PC (Version.1.0.1) IAEA-NDS-195. Vienna: IAEA; 1998. Thomas SJ. 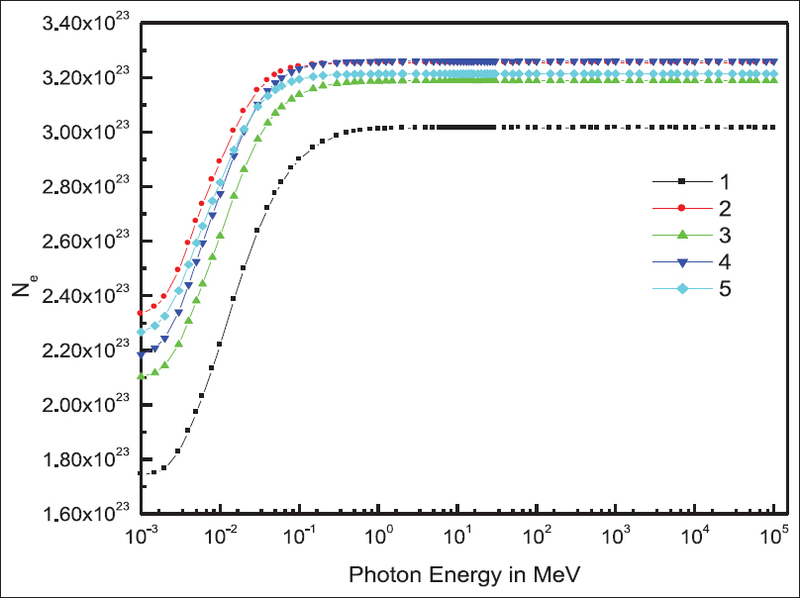 Relative electron density calibration of CT scanners for radiotherapy treatment planning. Br J Radiol 1999;72:781-6. ICRU. Radiation Quantities and Units Report 33 of the International Commission on Radiation Units and Measurements. Bethesda, MD: ICRU; 1980.